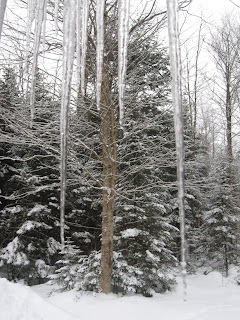 It is time to dispense with the Adirondack and nature inspired philosophical blog ramblings and to actually dispense useful information: my first Adirondack ski report of 2010. Skiing of any kind is currently superb in the Adirondacks. There is plenty of snow and great cruising on the groomed trails at Whiteface, Mount Van Hoevenberg, Cascade Ski Touring, and at all the maintained cross-country ski centers in and around Lake Placid. The High Peaks back country is in beautiful skiing shape; look for a more detailed report on bc conditions tomorrow, January 3. And to top off all this good news - there is also a dandy snow storm heading to the Adirondacks this afternoon through Monday morning, according to my friends over at Famous Internet Skiers (FIS).